Most mornings for normal people consist of a few basic elements. The alarm goes off and there is that moment of decision whether to get up or sleep a few more minutes. There is some sort of dressing and breakfast routine. Depending on preference, the morning may take place in a few hectic minutes or may take a few leisurely hours. I’m all for the leisurely mornings, anyone know how I can get one? 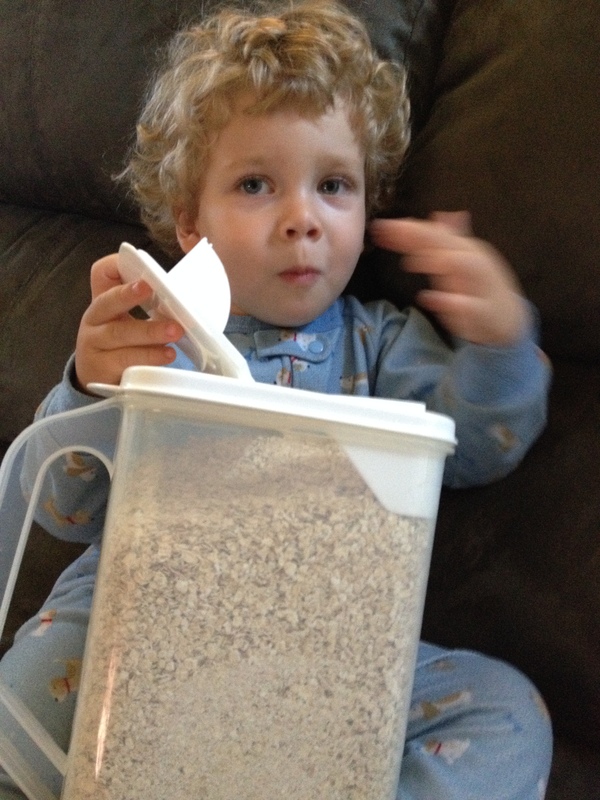 This morning at precisely 6am I was woken by a cannister of oatmeal. It wasn’t the oatmeal’s fault either. It had been removed from the kitchen by my two year old who decided it was time for breakfast. This kid must have been a ninja in a past life. He managed to escape his room, descend the stairs, loot the kitchen, and appear at my bedside, all without arousing the suspicion of either sleeping parent’s well tuned ears. Being silently presented with oatmeal is a far better way of waking up than finding someone standing at my bedside staring at me as it’s far less likely to cause a heart attack. I’ve had plenty of the latter at all times of the night. Apparently when my son sleep walks I’m the first person he visits, which is as freaky as it is flattering. I did end up making him oatmeal, it’s healthy and easy and thankfully cheap. I’m told Anne Hathaway used it to help her lose weight to achieve that starved look in Les Miserables. He didn’t end up eating it. While trying to scoot in his stool at the counter he ended up falling off and scaring himself. We cuddled with his sippy of milk instead. The days are numbered where he is small enough and will still let me scoop him into my arms and just hold him. I will take all that I can get until then. Even if it means being woken up by a cannister of oatmeal. He likes it dry if you let him! This entry was posted in Humorous Essay, Kids and tagged Anne Hathaway, humor, kids, mornings, oatmeal, Weight loss by Jodi. Bookmark the permalink. He’s so cute! It’s hard to get mad at a face like that..You’re right—your cuddle days are number and when they’re over you’ll be glad you took every opportunity when it presented itself. Enjoy, it passes too quickly. We love our little swimmy duck, even when he’s naughty. He managed to get himself lost twice on the fourth so there were even more hugs and snuggles than usual.